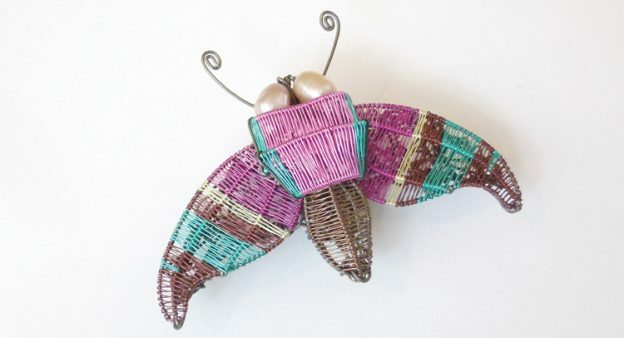 Kate’s work is a mass of animals, insects, pods and vegetables etc, wall-mounted, suspended, free-standing and wearable. Nature is the foundation and persistent inspiration for her work, interpreted through the interlacing of the thread-like wire that she twists and weaves to shape to form her designs. Delicate yet strong, Kate’s sculptural wire-work is made from thin colour-coated copper or steel wire, and black florist wire. Her most recent work includes larger framed and more complex wall pieces and Viking knit bracelets, all accomplished with gem stones or fresh water pearls. Kate graduated from Plymouth College of Art and Design in 2012. To view Kate Packer’s work, please click on her tag in the right hand column.